Click here to buy Cleaning, Food Handling, Laundry, Floor, Skin Care, and Automotive products. 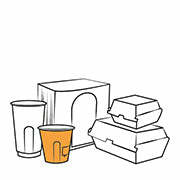 Click here to buy Environmentally friendly Packaging, Cups and Napkins. Click here to buy Childcare and Office products. Click here to buy Plastic Bags, Utensils, Cooking and Fast Food products. Click here to buy Towel and Tissue products. Click here to buy Toilet Roll, Soap, Paper Towel, Glove and Aerosol Dispenser products. Click here to buy Gloves, Mops, Cloths, Wipes, Scourers, Washroom and Janitorial products. Click here to buy Medical and First Aid products. Busiclean is a Perth, Western Australia based business that has been operating since 1996. We have been delivering disposable products all this time, starting with Dial a Nappy, the first company in Perth to deliver disposable nappies. Our product list has grown as our customers recognized us as reliable suppliers offering cost free delivery. In 2000 we bought a chemical manufacturer called Busiclean. We now manufacture a complete range of cleaning, food handling, laundry, floor and skin care products. Together with these we've added to our range: paper towels, tissues, plastic bags, gloves, safety products, cloths, mops, food packaging and containers and first aid.